The legendary Alabama storyteller, Kathryn Tucker Windham, used to say, “Alabama is like a big front porch.” She was right, I have found that to be the case my entire life. Even recently, as I’ve traversed the state, I am always amazed at how you can visit with someone in one part of the state who is kin to or were college roommates with someone in another corner of Alabama. The Alabama that Kay Ivey and I grew up in was even more like a front porch. Kay grew up in Wilcox County where her family had been for generations. Therefore, she knew most everybody in the county and Camden. There were and still are less than 12,000 people in Wilcox County. There have always been more pine trees than people in the county. She grew up with and has always been best friends with a trio of very accomplished people. As I sometimes say when I see someone who I’ve known all my life, I’ve never not known them. Kay has never not known Jeff Sessions, Jo Bonner, and Judy Bonner. She was like a big sister to them growing up in Camden. It’s truly amazing that a small South Alabama County just north of Mobile would spawn our U.S. Senator for 20 years, Jeff Sessions, Mobile Congressman, Jo Bonner who served Mobile, Baldwin and southwest Alabama for more than a decade, and former University of Alabama President, Judy Bonner, and now a Governor of Alabama, Kay Ivey. Even more amazing is that they grew up together and are contemporaries. They all have impeccable southern manners, and are all quick to say yes m’am, no m’am and thank you religiously. Some of you might think that Kay’s Black Belt accent is accentuated. It is real and unique and indicative of someone who has roots in that area of the state. You might notice that Jeff Sessions diction and accent is similar. The most important thing that can be said about Governor Kay Ivey, Senator Jeff Sessions, Congressman Jo Bonner and President Judy Bonner is that you have never ever heard one comment or even one inkling of anything unethical or improper or taint of scandal about their public or personal lives. Folks, they were brought up right in Wilcox County. Kay Ivey was born to be a leader. She was president of everything in her high school. She went to Girl’s State and was a leader there. By the way, she continues to go back to Girl’s State every year to counsel and help lead the organization. She spent a short stint as a teacher, then banker in Mobile. Then politics beckoned and another Black Belt, Speaker of the House, Joe McCorquodale, made Kay the Reading Clerk in the House of Representatives. She parlayed that job into a job as Legislative Liaison for the Alabama Commission on Higher Education. I really got to know Kay at this point. I was a legislator with a major university in my district. She was plain spoken, straight forward, and very honest. Kay has always been known for her integrity and upfront frankness and honesty. To use an old saying, her word is her bond. She will not lie and she will not cheat or steal. She was raised right. Kay then got into the arena. She was elected State Treasurer twice where she served for eight years. Then she was elected Lt. Governor twice. She ascended to Governor 20 months ago and has done an excellent job of steadying the Ship of State. She seems keenly interested and driven by economic and industrial development. That will be her hallmark legacy. The state is poised to grow economically and industrially over the next four years. In the closing days of her very successful race to be Alabama’s 55th Governor, she revealed in an ad a letter from her days as a young girl visiting Governor Lurleen Wallace in the Governor’s Office, a letter she had written about the Governor’s desk. “This is the closest I’ll get.” However, deep down, I believe she dreamed that one day she would sit in that chair and now she does. Kay Ivey is the second female elected Governor of Alabama. However, she is the first elected Republican female and the only female elected in her own right. She will be a good Governor. Probably the best we have had in a while. 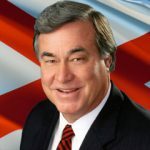 Alabama’s premier columnist and commentator, Steve has analyzed Alabama politics for national television audiences on CBS, PBS, ABC and the British Broadcasting Network. Steve has been an up close participant and observer of the Alabama political scene for more than 50 years and is generally considered the ultimate authority on Alabama politics and Alabama political history. As treasurer Ms. Ivey ran the Pact program into deep trouble. I hope your reporting of her will keep an eye on the economic development she brings and its costs to local governments. Nothing is free and the people of Alabama need good jobs along with fair taxes.